The leaves are changing in many parts of the country to vibrant reds and oranges and with that comes the thought of the next season that will descend upon us - plowing season. Whether you are responsible for removing snow from your own personal driveway or if you are a commercial snow removal contractor responsible for multiple accounts, the purchasing of snow removal equipment is on the minds of many as we prepare for the ground to turn white. 1. WHAT KIND OF SNOW PLOWING WILL YOU BE DOING? 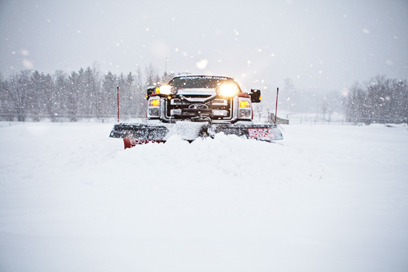 Before purchasing your next snow plow, consider how you are going to use the plow and how often. Are you a homeowner that has a long driveway to clear, but don’t plan on doing commercial work? In most cases, homeowners choose a 7’ or 8’ plow as this size is adequate for light residential work. However, if you are thinking about contracted snow removal of big parking lots, side roads, long rural driveways, commercial snow removal professionals generally want a larger plow as they are focused on removing the snow quickly and efficiently in an effort to move from one job to the next. 2. WHAT KIND OF VEHICLE WILL YOU BE USING FOR YOUR SNOW REMOVAL? The type of vehicle that you will be using for your snow removal is an important consideration when purchasing a snow plow. Snow plow recommendations are based upon the Front Gross Axle Weight Rating (FGAWR) of the vehicle that you own. The FGAWR is the specific weight determined by the vehicle manufacturer to be the maximum allowable weight that can be placed on the front axle. Because the vehicles axles should never be loaded beyond the manufacturer's listed FGAWR, the type of snow plow you put on the front of your vehicle should comply with these weight recommendations. If you are plowing your own driveway or several small residential driveways, most 1/2 ton pickups and in some cases, even smaller pickups and UTV's will work. If you are doing commercial snow removal, it is recommended that you use at minimum a 3/4 ton pickup truck for this type of work. Before purchasing a blade make sure to check if the blades weight is within the FGAWR for your vehicle. 3. WHAT TYPE OF SNOW PLOW BLADE DO YOU WANT? In general, either plow design will get the job done. Straight blade snowplows are still a big seller as they tend to cost a bit less than V plows. But the V-plow does have the ability to angle and direct snow – as well as “scoop” snow for stacking that straight blades simply can’t do. The v-plow also handles snow that has “frozen” overnight better than a straight blade. When put into the “V” position, the plow’s arrowhead configuration can slice through hard snow better than the flat surface of a straight blade. That slicing action also makes the operation easier on the vehicle and the operator. 4. WHAT TYPE OF PLOW MATERIAL DO YOU WANT? On the commercial plow side: All three materials will do the job for you, but each has its own strengths and weaknesses. Poly is the slickest material of the three, as such, snow will not stick to the blade and will slide off the blade easier and faster than it will with the other materials – as such, it is becoming the choice of more and more professionals out there. It is also extremely corrosion and scratch resistant. Stainless Steel has visual appeal and corrosion resistance and perhaps a slight advantage in “slickness” versus mild steel, but it is also prone to denting – any rocks you hit will leave “dings” in the blade. Mild steel has been used to manufacture plows for decades. Steel provides durability, rigidity and overall value. One common myth to dispel: Poly plows are not lighter than their steel counterparts. In fact, they are usually heavier. Why? Because the poly material lacks the rigidity of steel, it must be “backed” or reinforced with even more steel in order to keep its shape. As such – poly plows are commonly heavier than steel plows. There are more considerations when it comes to purchasing a plow, but this is a great starting list. Visit on-line plowing forums or Facebook pages of the snow plow brands to learn more or speak with your local snow plow dealer for help in making your purchasing decision.